Bulgemeister ..... apparently: What would you do? 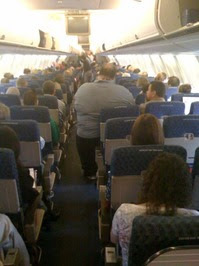 3. everyone else in the flight? I remember when I attended this work dinner that a prominent person seemed to be tightly squeezed in his chair. Some time during the dinner, one of the servers was sent to offer a chair, without the arms, to this person. I wonder what the server said when he was offering to change the chair to this guy?